The film, released in 1960, is based on the novel of the same name by Raymond Queneau, an author very much in vogue in those years. The plot, as in all the writings of Raymond Queneau, is simple and not particularly gripping: an impertinent and brilliant ten-year-old girl goes to Paris with her mother (who has a date with her lover) and is entrusted to an odd aunt-and-uncle couple: the uncle, especially, is an original crazy dude working in a nightclub dressed up as a forerunner of today’s drag queens. Free from the custody of her relatives, Zazie will try for the whole duration of the movie to travel on the Paris Metro, without actually succeeding because of a strike. In her travels through the old poor suburbs of the capital, the child makes strange encounters, meeting some ambiguous characters and finding herself in bizarre situations. Paradoxically, when at the end of the story Zazie manages to get on the craved metro, she does not even take notice of that, exhausted by the continuous wandering. Raymond Queneau is not new, as I said, at this kind of ” cut to the bone story”, believing that “how” you tell a story is more important than “what” is told. In his masterpiece “Exercises in Style” (masterly translated into Italian by Umberto Eco), Queneau describes a trivial incident that happened to him – an encounter with a guy dressed in a peculiar way, noticed on a bus and crossed again a few hours later near the Gare Saint-Lazare (railway station) – and he does so in ninety-nine different ways. The author rattles, in a long succession of literary gems, ninety-nine variations on a theme to write an insignificant “anecdote”, which in itself doesn’t contain any apparent motive of interest to the reader. 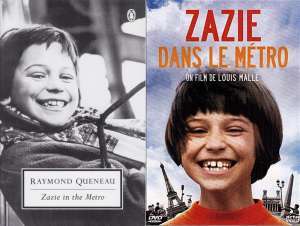 In “Zazie in the metro”, Queneau does the same thing, although switching from the short, repeated story, to the novel. It’s “how” you tell that counts, it’s the verbal expression of the characters, the argot’s pace, the schizoid use of phonemes. A praise should therefore be bestowed to the visionary director Louis Malle, not just for being successful in the difficult task of making a film seemingly impossible, but for having even thought, in advance, about the chance to realize it. And, to complete the daunting task, he will display all the possible technical oddities of those years, forerunners of today’s special effects: an editing with repeated-scene sequences, the use of comic strips’ balloons, and speed acceleration and deceleration. Everything in order to underline and mark the wanderings of a modern Little Red Riding Hood – however, perfectly capable of helping herself, not scared at all, even in the most troubling situation – roaming through a wood / Paris not at all postcard-like. Notice for cine-surfers. “Zazie in the metro” is not a movie for everyone: it is X-rated for people who read less than 18 books per year. Because Louis Malle’s work is a true literary product. And like all things that are born from the genius of man, it will find detractors as well as admirers: for some it will be just a nonsensical and pointless waste of film, for others the bright and ironic madness of a genius of words, magically lent to a genius of images.